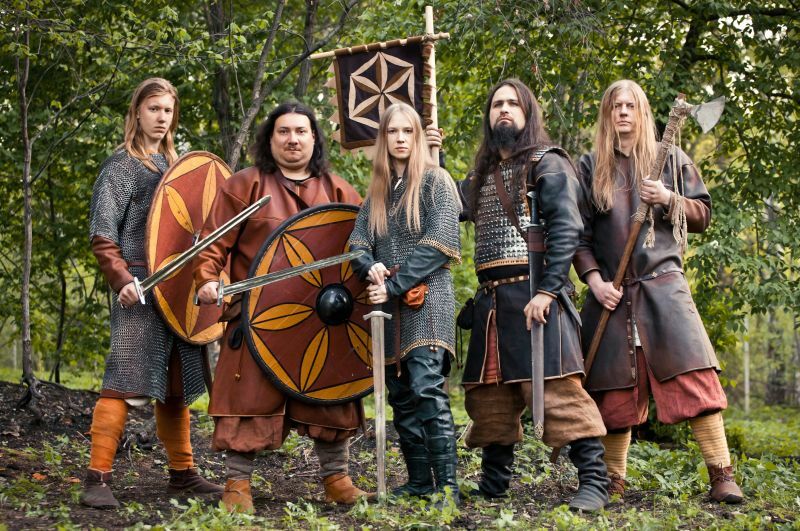 Of all the folk metal bands that have burst onto the scene in the past decade, Russia's Arkona is the only one of the lot to have had their music featured on an episode of "The Office" (the American version, of course). Now that's sayin' something. Fronted and creatively driven by the vocal contortionist Masha "Scream" Arhipova, Arkona has been blasting out their pagan-themed style since 2002 but have only recently - since 2009's Goi, Rode, Goi! - made significant headway in a multinational sense. All along the way, Arhipova has continuously sharpened the band's identity to fully embrace their Slavic heritage, pagan beliefs, and love of the more extreme elements of heavy metal. Arkona's new album, Slovo (The Word), is a monumental effort comprised of lush orchestration, stirring choral arrangements, rousing traditional melodies, and heaping helpings of blackened intensity....yet, I don't love the album as much as I should. Slovo has so much going on, with so many tangents and aggregations of differing styles, it was too easy to lose focus and let the album fade into the background. Ahripova's vocal style(s) epitomize the band's fluid sound. She can lure you in with a heartfelt croon or a seductive whisper, only to pierce your eardrums with a hellish shriek or a ghastly howl. Her ability to skillfully switch styles, often several times during each song, is a trait not common among vocalists and is a testament to her level of talent. Personally, I'm not a huge fan of extremely harsh female vocals so her fluctuating performance was a bit jarring. This intentional inconsistency, mirrored by the musical acrobatics, thwarts the cohesiveness of the album and prohibits the natural flow that makes good albums great ones. The songs themselves are of epic proportions, not in length but in style. Many of the tracks fail to establish an overall direction, instead journeying from bombastic riffs to pummeling blast beats to acoustic interludes...and back again. The complexity of track is impressive, and the various movements are crafted together quite expertly, but once again there is often more happening within each song than it can hold. The heavy use of traditional instruments is inspiring, however, and places Arkona ahead of bands that rely on synthesized melodies for their folk appeal. The effort that Ahripova and her band mates put forth in bringing to life the history and mythology of their Slavic lands is quite evident as Slovo progresses. The lyrics are entirely in Ahripova's native Russian, which for me adds yet another dimension to the power and mysticism that Slovo represents. Although I wasn't able to enjoy the album, as a whole, from start to finish, there were countless moments where my attention was riveted to a particular melody, riff, or refrain. The grandiose, medieval intro that is "Az'" sets the mood perfectly, while the chanting refrains of "Bol’no mne" were wonderfully soothing breaks from the howling verses. The mixture of accordion and mosh-inducing riffs heard on "Leshiy" created a rather unique, uplifting thrash atmosphere that fit well with Ahripova's deep and gruff singing. The list goes on, which tells me that Arkona is on the verge of creating something great, something masterful. But Slovo isn't quite it. Fans of folk metal will find much to like here, as will fans of black and death metal. Prog fans will appreciate the complexity of the arrangements. The pagan and historical subjects of the lyrics will intrigue many metalheads of the intellectual sort. For all of these reasons, Slovo shouldn't be overlooked. It's a decent introduction to Arkona, and an album worth investigating as we wait for the band's magnum opus.